The east Japan great earthquake and Tsunami killed about 20,000people and still 2,600 people are missing. About 178,000 people are forced to take refuge from their hometown. Huge amount of funding and manpower still needed to recover from the disaster. 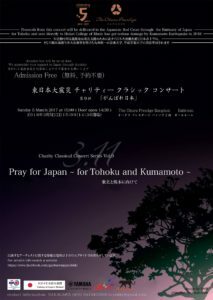 This concert series has sent about 950,000 baht to Tohoku in 5 years. And another big earthquakes hit Kumamoto in last April. This disaster killed 137 people and over 40,000 houses are collaspsed. Also Heisei College of Music a only music conservatory in Kyusyu area got huge damage. We support this college for young musicians as musicians.